Here, more than 70 teams of grand and world champion pitmasters bring their prized recipes and powerful stories to life in this exceptional cookbook. You don’t have to be a master chef to make these recipes; they have been scaled for the home cook wielding tongs at a backyard barbecue. Learn from the best in the business how to make Bone-Sucking Baby Back Ribs, Jalapeño and Applewood Bacon Burgers, Jack Daniel’s Whiskey–Infused Steak Tips, Chicken Satay Skewers with Sweet and Spicy Peanut Sauce and Raging River Maple-Butter Crusted Salmon, as well as casseroles, stews, side dishes and desserts that can be cooked on the grill. 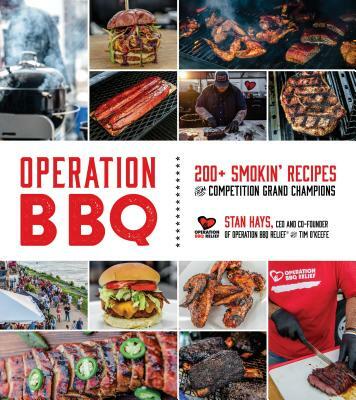 Stan Hays is the co-founder and CEO of Operation BBQ Relief®. As a barbecue competitor, he has participated in more than 35 sanctioned barbecue contests with two grand champion awards, four reserve champions and several top-ten finishes. He was also runner-up on Chopped Grill Masters on the Food Network. Operation BBQ Relief® has now served more than 1.78 million meals in 25 states. Tim O’Keefe is a certified barbecue judge who has judged over 40 contests sanctioned by the Kansas City Barbeque Society, and has been part of the Can U Smell My Pits competition team since 2015. Tim has contributed articles for National Barbecue News, and he co-wrote three cookbooks with pitmaster Bill Gillespie.